Everyone says to stay home during Semana Santa because the roads to get anywhere you'd like to go become like giant parking lots. I was thinking that maybe if we left and returned on an off-day, we could avoid the traffic, but who am I kidding? Ten million other people are thinking the same thing. So our idea this year is to stay in Mexico City for the 4-day weekend but find a pool or rooftop terrace to enjoy the weather. Perhaps better than that, we can enjoy the city when everyone else is on vacation. Alas, Mayor Ebrard had been thinking upon these very things, too. 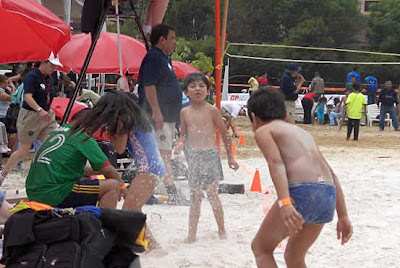 If you're too poor to afford a beach vacation in Cancun or Acapulco or you can't imagine spending one more second on the road but have a hankering for the beach, you might enjoy the city's artificial beaches at your municipal pool. That's right, sand, palm trees, and beach chairs right here in the city! These playas artificiales aren't exactly the serene beach setting you dream about in your head, but how serene could the beaches be this time of year? Honestly, the scene at these artificial beaches looks a bit scary to me. It looks like the experience in the city, with everyone fighting for a small space, be that on the street, subway, or sidewalk. As much as I want to be on the beach this Semana Santa, I think we're going to let everyone else left in the city enjoy this Ebrardian "Vamos a la Playa" campaign. 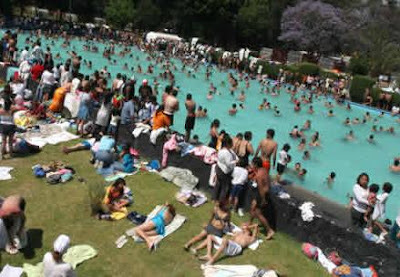 Where to find the nine artificial beaches: La Alameda Norte (Azcapotzalco), Deportivo Vida Sana (Coyoacán), Balneario Popular San Juan de Aragón (Gustavo A. Madero), Ex balneario Olímpico (Iztacalco), El Centro Deportivo Casa Popular (La Magdalena Contreras), Bosque de Tláhuac (Tláhuac), Centro Deportivo Villa Olímpica (Tlalpan), Alameda Oriente (Venustiano Carranza), and Deportivo Emilio Sáenz Ibarra (Iztapalapa). There are just so many things in this picture that frighten me. OMG - that is hilarious, who would have thought? I mean I guess it makes sense... I bet it costs an arm and a leg?? Like golf courses over there?? OMT - I think these pools are free. As scary as that picture looks, I'm kind of curious to see it. Cancun must be a scary place, too, during Spring Break. Leslie - So Spring Break is madness all over the country? I'm looking forward to a quiet DF. Amanda -- It's not an official holiday?!? I'm still hoping this city clears up and we get to see what living in small town Mexico might be like (probably still not going to feel so small, but I'm gonna dream about it). Happy Easter! Post pics on your blog of those chubby legs!